The Jungle Shrine is the first offering from WizKids in the new 4D™ Settings line. 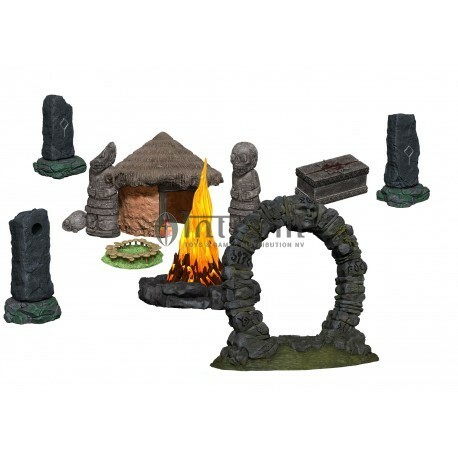 These scenes offer more than just pre-painted miniatures for you, they offer exciting new play experiences and storytelling narratives.With the Jungle Shrine set, you’ll have everything you need to set your adventure in a mystical jungle shrine. Will the runes on the standing stones open a door into the realm of faeries or trigger a magical trap? What happens when your players reassemble the broken statue? Where does the gateway lead? Who lives in the hut, tending to this sacred site? These are all questions you can pose to your players with the different set pieces included in this set. Since there’s no “right” answer to any of these questions, each piece has numerous ways it could be reused, providing a great value.This set will also be one of the first to include LEDs, with a light up fire and glowing rune stones!